Computer Updates: Make sure to keep your key programs on your computer (such as Windows, Java, Adobe and Norton) updated. Your computer integrity and security depend upon regular updates to these programs. It is easy to ignore these updates but over the long run keeping up to date will ensure smooth functioning of your computer and digital life. Passwords: Passwords are so important to our digital life. Usually people forget them and spend an inordinate amount of time trying to figure them out or resetting them repeatedly. If only there was a way you could have a strong password that you could remember. 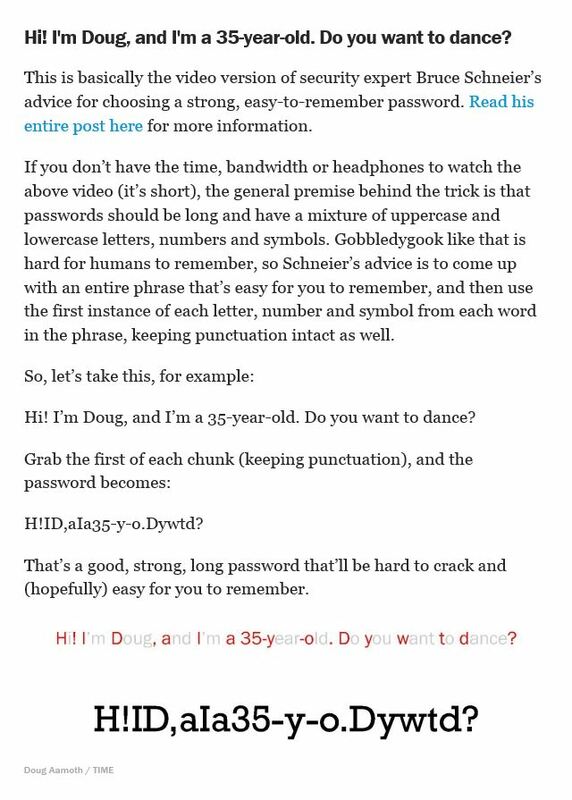 Click here for a quick tutorial on creating a strong password. It's easier than you think! (Link not working...click here). If you have more time, read this excellent article about how passwords are hacked so you can avoid the common mistakes when creating them. Check cable modem availability: Click on this link to see if cable modem access through Comcast Broadband is available. On left hand side click on "Availability" then enter your address and email. Test the speed of your current connection: How fast is your current connection? Please make sure to click "Begin Test" the site unfortunately offers other items for sale but test is a good one. Imaging Resource: This site extensively compares and reviews digital cameras and their output. The reviews are extensive and informative, the best part is that you have access to all this information for free. There is another feature of this site the "Amazing Comparometer" which lets you see the actual, unmodified camera images side-by-side, so you can scroll around and see exactly how various devices compare. Digital Photography Review: Another page that includes reviews pictures and lots of detailed information about digital cameras.